Whether you’re a computer geek or a motorcycle freak, there’s a cruise that’s right for you. “I never wanted to go on a cruise,” says Neil Grant, owner of an Asian decorative arts and feng shui business in Ottawa. “My mother immigrated to Canada on an old rusty boat, and the crossing was so awful she hardly ever talked about it.” But Grant changed his mind after his wife, Joan Leong, spied an ad for a week at sea that she thought could finally entice her computer-addicted husband on a Caribbean cruise. As Grant will tell you, cruise vacations are no longer just about playing shuffle board and pigging out at the buffet table. 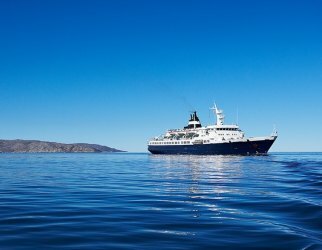 Themed cruises give all types of likeminded folk a chance to come aboard and share a common passion—whether that passion happens to be fitness or film, scuba diving or salsa, computers or cooking. What happens if your spouse doesn’t share your interest? No problem. Cruise organizers go out of their way to ensure a wide range of activities are on offer. For instance, while Grant hunkered down with podcasting lessons and digital photo applications, Leong got physical with aerobics and yoga classes. In between their classes, they enjoyed the view from their cabin veranda and joined other couples in touring Key West, exploring Mayan ruins in Guatemala and viewing the cheetahs at the Belize Zoo. On the other hand, if you would rather hone your skills on a keyboard instead of a chopping board, a Geek Cruise might be just the thing for you. Neil Bauman, a former computer programmer in Palo Alto, Calif., runs cruises like MacMania, Photoshop Fling and Aperture Aura for digital camera junkies. Bauman books cabins, meeting rooms and some of the top people in the computer industry, but his events only occupy part of the ship. Bauman got the idea for Geek Cruises when he took his family on their very first cruise in Alaska in 1998. They found they were sharing deck space with Trekkies on a Star Trek cruise. He’s since captained 37 geek weeks at sea on voyages to Hawaii, the Mexican Riviera, Alaska, the Mediterranean, the Baltic Sea and Central America Captain Neil, as he’s known at sea, is quick to emphasize that his techie participants are not an introverted lot. They break for round-robin dinners and shore explorations. “Yes, we love our Macs,” says Bauman. “But we’re an active, adventurous, full-of-spirit kind of group who are also addicted to life.” His next voyages include Aperture Aura en route to the Eastern Mediterranean, and Photoshop Fling to the Turks and Caicos and San Juan, Puerto Rico. For fitness enthusiasts: The Mind/Body Cruise with Shape and Men’s Fitness magazines will get you in shape to get in shape with a week of aerobic workouts, sunset meditations and one-on-one consultations with nutritionists. The fitness fun takes place on Carnival Cruise Lines’ Conquest as it sails from Galveston, Tex., to the Caribbean, beginning Dec. 2. Your shipmates will include experts such as Jon Giswold of the Reebok Sports Club in New York City and Kent and Maria Burden, authors of Yin Yang Fitness. Prices start at $659 (U.S.) double occupancy if you quote fare code CSSH. For more, call 800-227-6482 or visit www.carnival.com. For yoga fans: The Holistic Holiday at Sea will mend your body and soul with yoga, meditation, vegan and macrobiotic cooking. Organizers such as Sandy Pukel, author of the Greens and Grains on the Deep Blue Sea Cookbook, and speakers such as Deepak Chopra will participate in the search for enlightenment aboard Costa Cruise Lines’ Fortuna as it sails through the Caribbean beginning March 30; prices start at $1,195 (U.S.). For more, call 828-749-9537 or visit www.atasteofhealth.org. For scuba divers or snorkellers: Some Caribbean voyages on Princess Cruises offer snorkeling and scuba instruction, as well as open-water dives. Complimentary snorkeling sessions for those 10 and up are part of the New Waves package, which costs $359 (U.S.) for certified scuba courses. Also offered are scuba refresher courses and underwater photography courses (888-919-9819 or www.newwaves.com. For magazine junkies: A Most Civilized Literary Adventure allows you to swap mots justes with New Yorker magazine contributors including writer Adam Gopnik, film critic Anthony Lane and humorist Andy Borowitz as you sail from New York to Southampton, England, aboard Cunard Line’s Queen Mary 2. You’ll have a full week to discuss the creative process with these literary luminaries during group conversations, lectures and readings. The ship departs Oct. 7, 2007; prices start from $1,349 (U.S.) (800 728-6273 or www.cunard.com.